Officer Who Killed Tamir Rice Fired For Rule Violations On Job Application : The Two-Way Timothy Loehmann, the Cleveland police officer who shot and killed the 12-year-old in 2014, omitted key details "on his personal history statement." His partner was suspended for 10 days. Tomiko Shine holds up a picture of Tamir Rice during a 2014 protest in Washington, D.C. Timothy Loehmann, the police officer who shot and killed the 12-year-old boy, was fired Tuesday for answers he provided on his personal history statement during the hiring process. 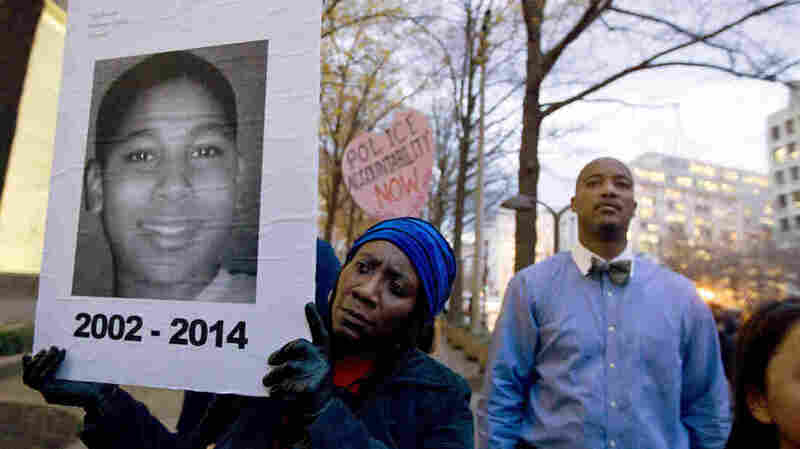 Timothy Loehmann, the police officer who shot and killed 12-year-old Tamir Rice in 2014, was fired by the Cleveland Police Department on Tuesday. At a news conference, city authorities announced that the reason for his termination wasn't the deadly incident that brought him to national attention, but rather violations he committed in the course of his hiring process. "Patrol officer Loehmann had been charged with rule violations concerning his application process to be considered a cadet with the Division of Police — specifically, answers he had provided on his personal history statement," Michael McGrath, the city's director of public safety, told reporters in prepared remarks. "Loehmann was allowed to resign from the Independence department after six months following a series of incidents where supervisors determined he was unfit to be a police officer. "The disciplinary letter cites a letter in Loehmann's personnel file from Independence that says he was emotionally immature and had 'an inability to emotionally function.' The letter also cites an emotional breakdown Loehmann had on the gun range in Independence." Cleveland authorities also announced that Frank Garmback, the officer driving the patrol car at the time Loehmann shot Tamir, would be suspended for 10 days for administrative rule violations of his own. He would also be required to take a tactical training course. The penalties cap a review process conducted by Cleveland's Critical Incident Review Committee, or CIRC, in the wake of Tamir's death and the widespread protests it elicited. As the Plain Dealer reported last month, CIRC already "found no fault in the officers' actions leading up to, during and after the Nov. 22, 2014 shooting at Cudell Recreation Center on Cleveland's West Side." In 2015, a little more than a year after the shooting, a grand jury also declined to bring criminal charges against the two officers. Rather, the Cuyahoga County prosecutor said at the time, it was simply a "perfect storm of human error, mistakes and miscommunications by all involved that day." "On a Saturday afternoon last year, Tamir Rice was playing with an air gun at a park on the west side of Cleveland. Someone called the police, mentioning in the process that the gun could be fake. "The dispatcher didn't relay the caller's doubts. "Soon afterward, police drove onto the grass within feet of 12-year-old Tamir. Investigators say surveillance shows Tamir reaching toward his waistband and lifting up an outer garment. Within seconds Officer Timothy Loehmann stepped out of the passenger side and fired two shots, striking Tamir once in the abdomen. Tamir Rice died early the next day." Tamir's death, ruled a homicide by the Cuyahoga County medical examiner, drew demonstrations both in Cleveland and several other cities across the U.S.
At the news conference announcing Loehmann's firing Tuesday, Cleveland Mayor Frank Jackson offered "condolences to the family of Tamir Rice." "You know, it's difficult when a child — in this case, a 12-year-old — loses their life," he said. "It makes it even more challenging and more difficult in terms of accepting it if it happens at the hands of a police officer."